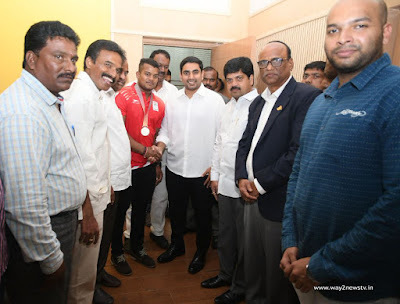 Andhra Pradesh Minister Nara Lokesh honored Venkat Rahul,who got gold medal in Commonwealth Games at Gold Coast in Australia.Rahul, who went to the minister's office in Amravati on Wednesday, met him.He showed to him the gold medal winning at the Commonwealth.This was revealed by Minister Lokesh through his Twitter account.The photos are also tweeted. 'Proud Moments. Felicitated Venkat Rahul Ragala, on winning Gold in the Men's 85 kg category at the commonwealth games 2018. On behalf of AP Government, we assure all the support in his pursuit for top glory at other events in the future"Lokesh said in the tweet. Andhra Pradesh Chief Minister Chandrababu has already congratulated Venkat Rahul on the occasion. On April 12, Twitter has announced that Venkat will announce Rs 30 lakh cash incentive. In this regard, the CE commented that achievements in the poverty, if successful, achievement. Venkat Rahul, who is the first gold medalist in the Commonwealth, has gained praise from sports, political and film personalities. Janasena supporter Pawan Kalyan has tweeted to congratulate Rahul. Rs 10 lakh will be given for the Jansana party. Venkat Rahul's hometown is Guntur district Bapatla zone of Stuartpuram.